The ST3-S series robot is designed for rapid and precise removal of products from injection molding machine, and place them at desired locations. Apply to 2-plate mold or hot runner system. 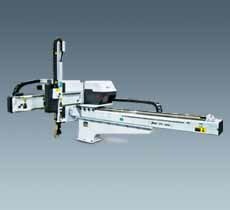 Capable of arranging, stacking, quality checking and in mold placement. Suitable for injection molding machine with clamping force under 300 tons. All linear movements are driven by heavy duty servo motors with cooperation of precise linear guide rails and high power V belts; fast, silent, and precise. 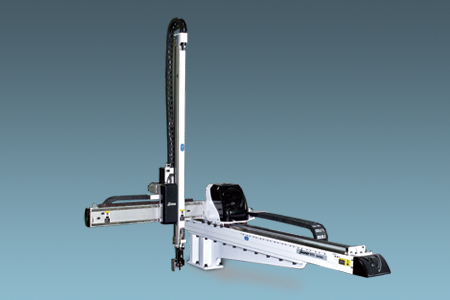 Wrist mechanism employs pneumatic driven rack and pinion system, which accomplishes smooth, stabled and precise flipping motion. Vertical arm with telescopic design efficiently minimizes the cycle time and height of the robot. Position limit sensors and blocks effectively prevent mechanical and electrical malfunctions. Control board with short circuit function. 8.0 inch high definition TFT touch screen. 3-point switch for safer robot operation. CPU modularization, the operator, main control modular and extension modular has independent CPU, improve the system’s respond and keep it safety. The hardware used multi-layer PCB and multi-rank high precision electrical modular, strong anti - interference ability. Hardware protect function, each signal output with intelligent detection, avoid short-circuit, overload and high temperature. Base on the VARAN BUS technology, the system can be extended, strong adaptability and flexibility. Teach modules with stacking and matrix locate functions, support conditional judgment, loop control, signal waiting and others logic instructions. Multi languages displays and spared communication connections with surrounds machines offer more flexibilities to global customers.